Risk-averse Greg Belmont is content with being ordinary. He's got a friend--that's right, just one--at his fancy prep school, and a pretty cool dad (even if he is obsessed with organic soaps that smell like a mix of salted pork and Icelandic bog). The problem is, Greg isn't ordinary . . . he's actually an honest-to-goodness, fantastical Dwarf! He discovers the truth the day his dad brings home a gross new tea--one that awakens bizarre abilities in Greg. Then a murderous Bro-Troll kidnaps his dad and Greg is whisked away to the Underground, where Dwarves have lived for centuries right beneath the streets of Chicago. With the help of some awesome new friends and a talking ax, Greg learns all about the history of the Dwarves, which has been marked with tales of epic failure since the dawn of time. However, the return of the magic they once wielded means big changes are afoot, escalating tensions with the Dwarves' sworn enemy: the Elves. 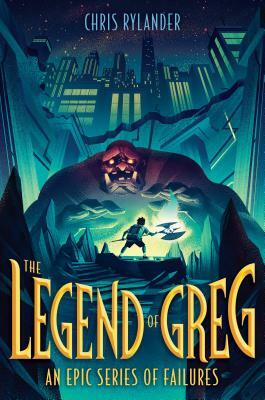 Brimming with humor and action, Chris Rylander's The Legend of Greg turns dwarf lore on its head, delivering an adventure readers won't be able to resist. Chris Rylander is the author of the Fourth Stall saga and the Codename Conspiracy series. A fan of chocolate, chips, and chocolate chips, he lives in Chicago.